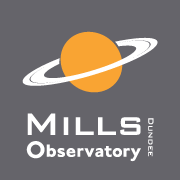 Visit the Mills Observatory on a Saturday afternoon and enjoy a range of astronomical related activities with the assistance of volunteers from Dundee University. Attendance is free of charge. Oct 20 - "Great Moments in Astronomy"
Nov 17 - "Witnessing Star Formation Through Different Telescopes"
Dec 8 - "The Big Bang Theory"
Jan 19 - "A Spacecraft's View of the Solar System"
Feb 16 - "Finding Your Way Around the Night Sky"
Mar 16 - "Stars in Your Eyes"
These events are free of charge with no booking required.